An ambitious but controversial plan to clean up the Great Pacific Garbage Patch moves closer to reality this week, with the deployment of an ocean plastic cleanup boom off the coast of the Netherlands in the North Sea. The 100-meter floating boom is a scaled-down version of a 100-kilometer long system that Dutch nonprofit The Ocean Cleanup eventually hopes to deploy in the Pacific Ocean between California and Hawaii. The boom is meant to slurp up the millions of tons of unsightly plastic comprising the Great Pacific Garbage Patch. 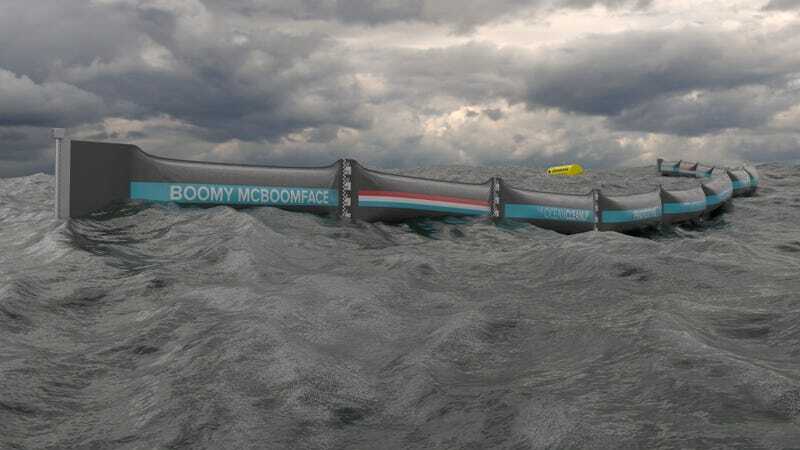 The prototype, aptly named “Boomy McBoomface,” will sit roughly 20 kilometers off the Dutch coast for a year in a critical field test of the system’s survivability. The Ocean Cleanup’s mission has garnered international media attention, thanks in no small part to the nonprofit’s charismatic founder, 21-year-old Boyan Slat, who was just 18 when he started working on the idea. The basic concept is to use currents, wind, and waves—the natural motion of the ocean—to push plastic garbage into screens that extend outward from floating booms. The booms, which are anchored to the sea floor through a system of cables, form a V-shaped structure that concentrates plastic at the center, where it can be easily harvested by collection vessels. To bring that concept to life, the nonprofit has assembled a team of engineers, who’ve spent the last year testing a small-scale model at a maritime research institute in the Netherlands. That the team is already moving to field trials speaks to the strong public support for the project, which raised over $2 million in a crowdfunding campaign in 2014, and secured an additional million dollars for its prototype test from the Dutch government and private supporters. The full-scale structure is expected to cost roughly $350 million. But the plan is not without its critics—namely, members of oceanography and marine biology community, many of whom feel the design hasn’t been properly vetted and are worried about the potential ecological impacts of what would become the largest offshore structure ever assembled. After The Ocean Cleanup published a lengthy feasibility study in 2014, oceanographers Kim Martini and Miriam Goldstein responded with their own technical review, which found “major issues” with the plan. These included the use of average rather than extreme current speeds, which could cause engineers to significantly underestimate the loads and tensions the structure will be subjected to in the field. The feasibility study also failed to address biofouling—the accumulation of life forms that’ll add weight to the booms over time. What’s more, it’s unclear how the company will fix the system should a catastrophic failure occur in the middle of the ocean. In it’s crudest form, an FAD is any floating, semi-stationary structure in the open ocean. Prey species tend to aggregate under floating structures, and predators naturally follow. The Ocean Cleanup won’t simply act as a barrier to migration, but will also attract pelagic species. Long term, this could create permanent or semi-permanent communities, resulting in changes to migratory patterns. Goldstein and Martini, meanwhile, received no feedback to their analysis outside of a video response from Slat, which downplayed their qualifications for commenting on engineering issues but acknowledged that they made many “valid points.” How many of those valid points are being acted on is unclear. It’s possible that The Ocean Cleanup will address many of the concerns its critics have raised before deploying the full-scale array in 2020. The nonprofit is reportedly conducting an environmental impact analysis with Royal Haskoning DHV. And with its newly deployed prototype, the group stands to learn a lot more about how the system will fare and how it may fail under stormy conditions. Update 6/23/16 4:15 pm: Kim Martini has just posted some additional thoughts (and great questions, including why the heck is The Ocean Cleanup using RO-BOOMS, which have been around since the ‘90s?) on the blog Deep Sea News. Check out her post here. Update 6/24/16: A spokesperson for The Ocean Cleanup responded to Gizmodo’s request for comment on concerns raised by certain members of the scientific community. He emphasized that the tests being run in the North Sea are intended to determine what could be wrong with the boom design and to identify possible modes of failure. The Ocean Cleanup is also aware of concerns that their boom system could act as a Fish Aggregating Device. This is something it plans to monitor and continue studying with the engagement of the marine biology community, the spokesperson said.